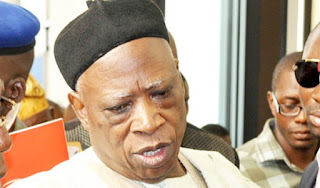 The Leader, Buhari Parliamentary Support Group, Senator Abdullahi Adamu (APC-Nasarawa), said yesterday that Senate President Bukola Saraki should be prepared to bear the consequences of his defection from the All Progressives Congress(APC) to the Peoples Democratic Party (PDP). ”If Saraki knows political intricacies and the political terrain or the path where the banana peel in political landscape is, he will be more cautious,” Adamu said, adding:”the way he is going now, he has obviously stepped on banana peel and only God knows how far he will slip. Adamu vowed that with the defection, it would not be business as usual. “Before the defection, we spoke with some of them, but they insisted on defecting with Saraki. We will see where it will take them. They are expecting automatic tickets. For me, it is automatic ticket to failure. They will have and they will fail. Write it down,” he said. Some PDP senators would soon joined APC.